Over the past 30 years, around 200 species of amphibians have disappeared due to chytridiomycosis, a fungal infection. The scientific community has attempted to fight the pathogen, without success. Now, an international research group has reviewed every technique in order to prevent the effects of this disease and local extinctions. "There are several alternatives for mitigating chytridiomycosis that are more effective than trying to prevent the pathogen from arriving or eradicating it from the environment", Jaime Bosch, a researcher at the National Natural Sciences Museum (MNCN-CSIC) in Spain and co-author of the new study on controlling the infection that has attacked 200 species of frogs, toads and other amphibians, tells SINC. After reviewing all the current mitigation actions  or those that could possibly be developed in the near future  the researchers have concluded that new strategies based on the use of different methods to control infection levels "could be enough to prevent outbreaks of the disease and could, therefore, largely prevent local extinctions", says Bosch. The study, which has been published in Frontiers in Zoology, has shown how the fungal amphibian pathogen (Batrachochytrium dendrobatidis) has been dispersed by human action. "It is a phenomenon that is practically unstoppable in our globalised world", the biologist explains. The fungus has been implicated in the extinction of amphibian populations and species all over the world for many years. However, until recently the only effective way of tackling this disease seemed to be to prevent it from dispersing and to establish captive colonies of species at the greatest risk of disappearing from their natural habitat. The research highlights various local experiments that are using new strategies in a bid to mitigate the disease. 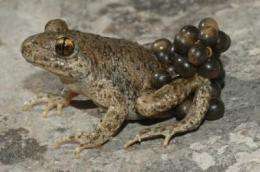 In the case of Spain, the Peñalara Natural Park (Madrid) is of particular importance since it was the first place in Europe that suffered an outbreak of chytridiomycosis, which brought the common midwife toad (Alytes obstetricans) to the brink of extinction. In one of the few populations that managed to avoid extinction, for example, tadpole numbers fell from 5,000 to 20 individuals. One of the pilot studies, led by Bosch, involves keeping infected tadpoles in captivity at temperatures of over 21ºC, which is higher than in their normal environment. The tadpoles are kept in this condition until they undergo metamorphosis, when they are released, even though some of them still test positively for the infection. Since 2009, the number of amphibians surviving has increased, thanks to a new heat therapy using baths of the antifungal itraconazole. However, the reinfection of treated animals "is possible with both treatments", explains the researcher, adding that "it is still too soon to recommend using them, because of the risk of Batrachochytrium dendrobatidis becoming resistant to the itraconazole". In 2008, the Government of the Autonomous Region of Madrid, the MNCN and the Durrell Wildlife Conservation Trust also set up a captive breeding programme in order to maintain some populations in case of extinction. The future young will be tolerant (reducing the impact of infection) or resistant (able to fight off the pathogen), although rescued amphibians naturally have genes that confer tolerance against the disease. More information: Woodhams, Douglas C.; Bosch, Jaime; Briggs, Cheryl J.; Cashins, Scott; Davis, Leyla R.; Lauer, Antje; Muths, Erin; Puschendorf, Robert; Schmidt, Benedikt R.; Sheafor, Brandon; Voyles, Jamie. "Mitigating amphibian disease: strategies to maintain wild populations and control chytridiomycosis" Frontiers in Zoology 8 Article Number: 8, 2011.